An ISB alumnus from the Class of 2006, Neeraj Arora, Vice President, Whatsapp Inc., is the man behind the billion dollar Facebook – WhatsApp deal. At WhatsApp he is known as the ‘Business Guy’ for want of a better designation given that he ended up doing everything to broker the deal – a purely business skill. Reema Gupta, Associate Director, Srini Raju Centre for IT and the Networked Economy (SRITNE), ISB, caught up with Neeraj on his day back at the School, when he interacted with the current Class. Excerpts from the conversation. 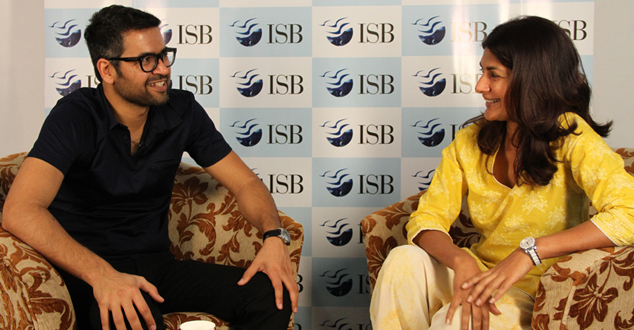 Reema Gupta: Welcome to the ISB, Neeraj and it is a pleasure to have this opportunity to chat with you. Neeraj Arora: Thank you for having me here. I wanted to talk to you a little bit about technology disruption and how innovation happens and the role strategy plays in making a product go from an innovation, or from an idea, to actually being accepted in the market place. What does it take to make a product from an exciting idea to actually being a disruptor in the market place. Is it that just having a good idea is enough or is there a strategy behind it? I think idea is definitely very important because that is the seed where you start and that is what excites you. But I think there are a couple of things that are really more important than the idea itself. For instance we are not the first messaging product. There were many before us and there have been many after that. So I think to take an idea from just an idea to execution and a successful product requires a lot of attention to behind what the users exactly want at the end of the day. So if you have a very good sense of what your users want and if you can work around it, I think, the bridge between an idea and a product that many millions of people can actually use every day is built. So I would say that focus on execution and defining what your users want is more important than the idea itself. That leads me to the second question. You were saying that there was a lot messaging engines and Blackberry actually was the leader. Focus on execution and defining what your users want is more important than actually the idea itself. What do you feel are the key characteristics that differentiate WhatsApp that user found acceptable? There was no one single thing that we did but there were a series of things that we thought about to make the experience much better than anyone else out there in the market. For instance before WhatsApp we had BBM, Skype, Yahoo Messenger and MSN Messenger. But when we started and we had this vision of being only on the mobile phones. We did not want to be on laptops or PCs. We thought why do we still live in this world where people have to create accounts and have passwords and then have to add somebody and they have to accept. There was a lot of friction in allowing two people to talk for the first time. Nobody really thought about it in the new world where you have phones which have become your primary means of accessing the Internet. So we said okay, we are going to take the friction off. We will have your phone number as your id, we will not have a username or a password. You don’t need to add anybody. If you have somebody’s phone number in your address book and they are a WhatsApp user, then you guys are automatically connected. So we took the whole friction out of connecting with other people and that I think was the biggest innovation we did. We were the first ones to come up with this whole system of using the phone number as the id and then not having the passwords, adding or deleting people. If you have somebody’s phone number you are connected. It is just like SMS. So at some point you have to break it and start fresh. And we had the fortune or good luck to be forced to do that because we did not have an internet presence before that on the website. Taking an idea from just a thought to execution and a successful product requires a lot of attention to what the users exactly want. Could you talk a little bit about how you arrived at your business and revenue model? While the Online space focuses on ad revenues, what made you take a different approach to it? Absolutely! When we started about five years back there was one thing that was very clear. Both our founders had actually come from Yahoo! which was basically an ad driven company. So when they started WhatsApp they wanted to do something different. The only thing you do on WhatsApp is connect with people. It is very private. Ads somehow do not fit well in this whole thing, as having them on our platform will mean collecting a lot of data about users and serving them ads depending on where they come from, what their age is and all of those things. We did not want to do all that. There are also some benefits to not collecting data because you don’t have to put teams to do it. We believe in simplicity. We don’t have the bandwidth to do all those things so we were forced to think of another business model because we like sustainability. We did not want to be like a company or a hobby where we have a cool product but there are no financials behind it. When we started growing on iPhone the team was so small we did not have the bandwidth to hire fast enough to support that growth. We said okay, let us make the product paid and it will slow us down and we will have a good way of controlling growth and serving our users better. But still we saw people paying for it, though it had slowed down a little bit. That meant that we were doing something so valuable and people were willing to pay for it. That is from where the whole idea of charging a subscription came about. If you keep on focusing on what is most important to the user and give them a good quality product there is no reason for them to leave and go to somebody else. If you are delivering on what you are promising, they will stick with you. Do you think that going forward more and more people are looking at a subscription-based service? It depends on the product that you have – whether it is personal or private. If it is a very public product like Twitter or Facebook, where you post a lot of stuff which is not private and personal that is okay. Our product lends well to non-ad-based business model than other products like Facebook, Twitter and Google which have a good ad based business model. WhatsApp has seen a phenomenal growth, 600 million subscription base globally and 70 million within India. What is the long-term strategy of WhatsApp? There is competition definitely on the heels. So how do you sustain the leadership that you have built and is it always the case that you might be the ahead first but not necessarily for a long time? We were not the first ones as I said before. We think we do things better than everybody else. The quality and speed of the product we have, with the reliability and efficiency of messaging, it works really well on 2G networks on so many different phones and we are the most crossed platform application out there. We tried to be as accessible as possible to everyone and that has helped us a lot in our growth. I think if you keep on focusing on what is most important to the user and give them a good quality product there is no reason for them to leave and go to somebody else. If you are delivering on what you are promising, they will stick to you. And what we have seen so far is that we have been able to give users what they really want to do, which is to connect with their friends and family. There will always be a segment of users which want something else. You were talking about group size; we are limited to a group size of 50 and we have very good reasons for it. We think that if groups become very big they become very noisy and the product loses its value and that is why we try to limit it. But I understand that some groups like alumni and student bodies will need bigger groups and products that they can use. I would like to get your perspective on innovation from a corporate side of things and as also from a product perspective. What enables this innovation? What kind of eco system do we need? In India there is a lot of buzz about creating entrepreneurs. There are a lot of hubs being set up by organisations. You having experienced both sides and now being based out of the Silicon Valley; what is it with the Valley that enables and fosters innovation? I think there are a few building blocks here. If you want to create successful companies that last forever and have a global impact, one of the most important things that you need is the talent. In any company, the biggest thing that drives a vision or a product or an organisation is the talent that you have. Even if you have a setup of five people or twenty people, you can actually achieve a lot. So I think having that abundance of talent helps a lot. Talent is the key. It is now improving in India. We are also seeing cross pollination between India and the U.S. and other parts of the world. People are going and coming back and starting companies, that is improving definitely. But I think Silicon Valley has always had that edge because they created the CISCOs of the world and Google and then PayPal and there are so many other companies. And there are alumni who have gone and started more companies, it is kind of rolling now for them. India is starting and we have good companies: Flipkarts of the world, MakeMyTrip; they are starting to happen. Then in a few years we will see people who are holding these companies – experience starting their own companies. So talent is very important. The second part is the whole capital availability. At the end of the day when you start something, the probability of success is very low. So if 1000 ideas are started today, 90 percent or more will fail. So you have to be okay with that and the fact that you will actually not recover the money for those ideas that you support. And Silicon Valley or some other parts of the world have reached a stage where you are okay with risk and have the appetite where they say okay, fine, if only two or three ideas click among ten. We need maturity for that and that is going to happen over time. The third is the overall market size. If you start a company today the first market is always going to be India if you have a consumer product here. We did not have that many internet connected users to consume the products that we were creating five years back. Today, we have that base. I was reading just yesterday or the day before that the head of Google India saying that India is going to overtake the U.S. as the biggest internet market very soon. And that is very promising. Our domestic consumption is improving and again that is an eco-system level change that has happened over time. There are better mobile phones and better data networks. It is all coming together. It is also a matter of time when these things come together. Now we have the talent, we have the money coming in and we have the domestic consumption. So hopefully we will see a lot more. And at the end of the day it is role model right. People look up to Sachin from Flipkart and Kunal from Snapdeal and other entrepreneurs, who have taken the risk and struck it out and created valuable companies. Now people are looking at them and learning from them. So we can hope to see the next WhatsApp from India? Absolutely there is no reason why WhatsApp cannot come from any other part of the world. From a policy perspective do you feel that the government can do somethings to enable more of this entrepreneurial activity? Not government’s policy but I think the mindset is important. I think I have seen that with the new government. The mindset is to encourage entrepreneurship and wherever they can actually partner with private companies they are doing it. Encouraging and supporting these activities is very important for the government. Governments don’t need to get involved but they should create and facilitate the right environment for people who are investing money into India. So government should make sure that investors feel secure and feel good about investing in India. So if you create that mindset and provide that environment I think everything else is there. I feel very positive about the new government actually. One last question. There is a whole plethora of technologies out there. From your experience do you see there are going to be two or three technologies that are going to be the big leaders in the coming decade? And also from an Indian perspective what would be the next big thing like mobile has done phenomenally well for the Indian market? That is exactly right. I think the mobile will continue to stay very relevant for a long time because it is just the beginning. And there is a lot more growth to be had in India and globally. India is definitely leading it today. And the other big thing round the corner is the onset of sensors that are connected to the internet and are automatically measuring things around you and doing the job for you. That is a good trend. But it is too early and difficult to predict what will happen next or what will come out of it. But I see a lot more people trying to do things around it and money being invested. Lastly this sheer economy is becoming more and more independent. You have seen Uber, how well they have done even in India. So this new concept of, ‘I don’t need to have a resource if I can actually have it shared by people’- It has become very important. It is still again a very early trend and we will see where it goes but a lot of different companies have been built around it. They are already up, very prominent now; Airbnb is another one. There are a lot of food delivery companies that are getting started. So we will see where this trend goes but I do find it very fascinating. If I can live without owning a car that is really cool right.